Tired of Gmail’s boring blank wallpaper? Think the built-in Gmail themes are a bit too cheesy? If so, you’re in for a treat. Buried in the list of color, HD, and “classic” Gmail themes is a pair of customizable themes that let you upload your own images—perfect for decorating your Gmail inbox with vacation photos, art shots, baby pictures, you name it. 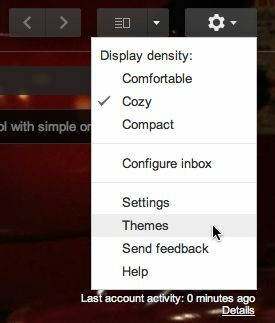 Click the gear icon and select “Themes” to get started with your own custom Gmail background. You can upload photos from your desktop, your Google+ account, your Android or iOS device (assuming you have the Google+ social app installed), or you can even plug in the URL or a photo from the web. 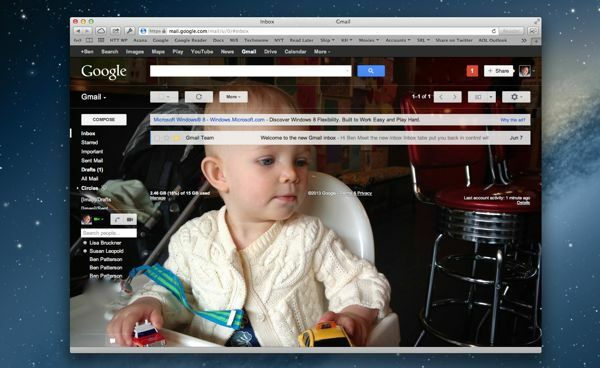 Open Gmail, click the gear icon in the top-right corner of the screen, then select Themes. Scroll down to the Custom Themes section and click either “Light” (for a lighter-looking Gmail inbox) or “Dark” (for a slightly darker inbox). Don’t stress about which one to pick; you can easily change your mind later. As soon as you click, a pop-up window titled “Select your background image” will appear. Click “Upload photos” in the left column to upload an image from your desktop, or click “My photos” to select pictures from your Google+ profile. You can also click “Paste a URL” to grab an image from the web, or “Photos from phone” if you have the mobile Google+ app installed with “Instant Upload” turned on. 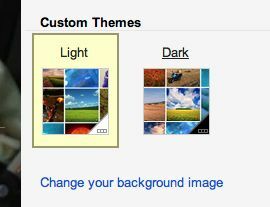 You can upload your own Gmail background images by selecting either the “Light” or “Dark” custom theme. That’s it! Within a second or so, the image you selected will become the background for your Gmail inbox. To change your custom background, go back to the Themes setting and click “Change your background image” under the “Custom Themes” heading. You can also switch your custom theme from “Light” to “Dark” by clicking the appropriate icons—and no, you won’t have to upload your photo again if you do so. Want to delete an image you uploaded for your Gmail background? Just go to your Google+ profile (click your name in the top-right corner of the main Google page), move your mouse over the Home icon, click Photos, click the photo you uploaded, then click the Trash icon near the top of the page. Looking for more Gmail tips? Click here!